There is plenty good to say about these headphones if you take the studio out of the equation. For everyday wear and use these headphones are fine. The highs sound lovely through these and for your average music listener, these will do fine. I hate to say it, but these headphones are totally useless as studio monitors. They don't have the ability to produce the types of sounds needed for studio work. The bass is weak and the layering is just not there. Also, they're really tight and may be very uncomfortable for some people. These headphones are no good for the recording studio but that doesn't mean you can't listen to your favorite CD at home. These are affordable headphones (though somewhat uncomfortable) that will suit everyday usage. These headphones are too tight on the head and the sound is nowhere near studio monitor quality. The Sony MDR-V150 with reversible ear cups is a bit of a mixed bag; they're like the little headphones that could. But at their inexpensive price, I'm surprised they do so much. Let's be perfectly clear here. These aren't the headphones you'd use to master any tracks (but really you shouldn't be using headphones for that anyway). With a frequency range of 18-22000Hz, the Sony MDR-V150 headphones don't match the wider range of higher priced headphones, but they're hard to beat when you take their price into consideration. The bass response of these headphones was somewhat weak and I found myself tweaking the EQ on my computer in efforts to correct the problem. The high range on the other hand, unlike the bass, is beautifully reproduced, offering crisp tones and clear peaks. I found the headband to be awfully tight, but this varies depending on the size and shape of your head. Some people like tightly fitted headphones (I'm not one of them). I did, however, get used to them after a while. Some users will take issue with the extra long six-foot cord included with these headphones. I'm not sure I understand the problem with that, as I find the extra long cord useful. It gives me a greater degree of freedom to move around my office and home. I'm concerned with the joints on the ear cups and the ear cups themselves. The joints seem rather flimsy and prone to breakage, and the ear cups don't sit as comfortably or tightly around the ear as other headphones do. 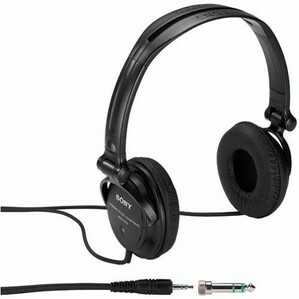 The Sony MDR-V150 are a decent pair of inexpensive headphones. At less than $20 it's a good buy if you just need an extra set of headphones, or a backup set. I definitely wouldn't use this as a primary pair of monitoring headphones. Amazon has the Lowest Price Here. What remedy is there for replacing the material covering the ear cups? I would advice you contact the maker for spare parts. Perhaps Amazon sells them.